I love aloe vera plants. They are both an interesting feast for the eyes and useful. I'm not too sure about the science behind rubbing a sunburn with aloe vera, but I do know that it sure makes it feel better, and that's reason enough for me to always keep this plant in our house. 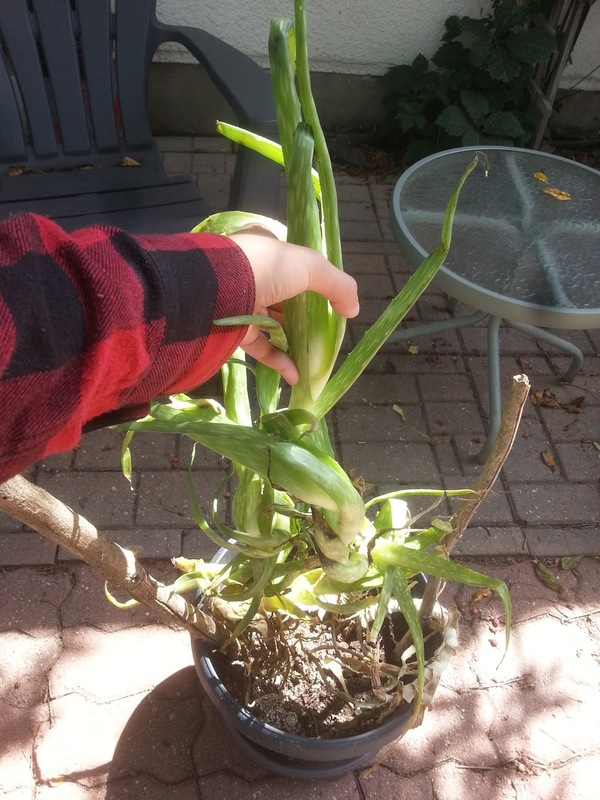 When we first moved into our house a few years ago, my mom gave us an aloe vera plant. I had since neglected the plant and only paid attention to it when I needed to steal one of its leaves. I just kept winding its leggy stalk around the pot. Well, yesterday my husband had a sunburn. He was pouring concrete in the hot sun all day. 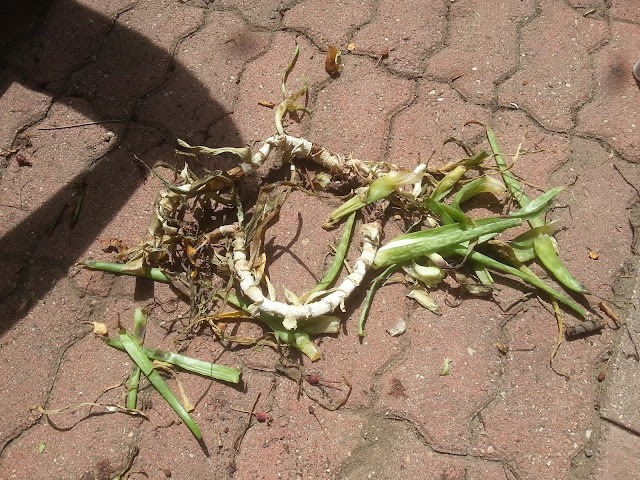 I ran over to my trusty aloe vera and stared down at its sad state of being. 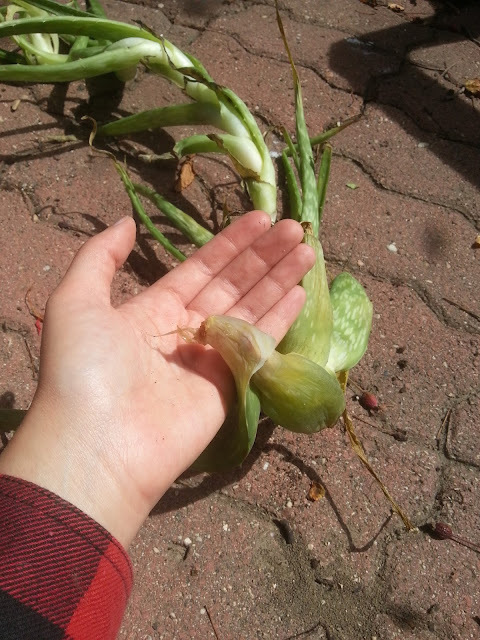 I made a silent promise to the plant as I plucked one of its leaves, that tomorrow, I would prune it. 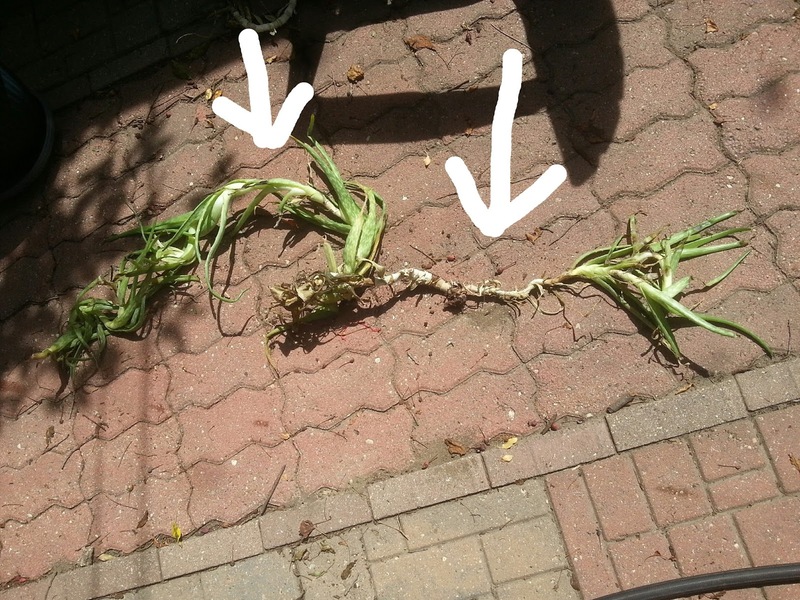 I thought I would make this into a tutorial as aloe vera plants are kind of unusual and how to prune them is not as immediately obvious as many other common household plants. Choose your workspace. I chose to work outside, as working with plants can get messy. If you can't work outside, line a hard surface floor with newspapers before proceeding. 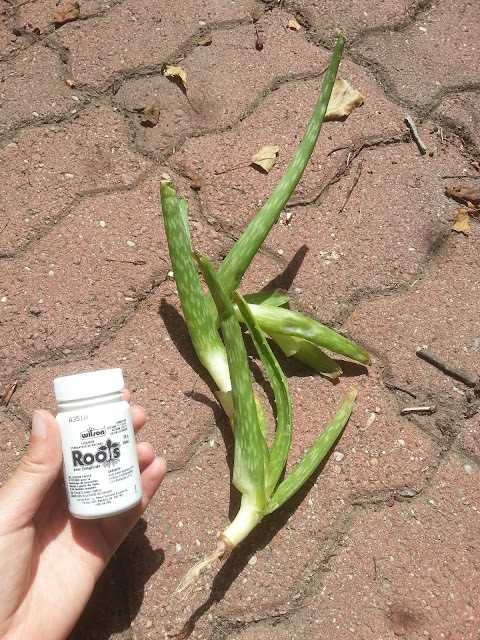 Gently lift your aloe vera plants out of the soil. Mine wasn't even really connected to the soil. It was just sort of laying on top of it. 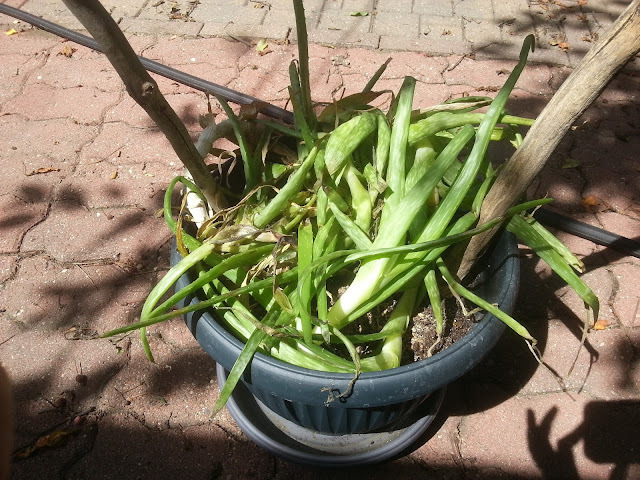 Lay your aloe vera plant(s) aside in a safe place. 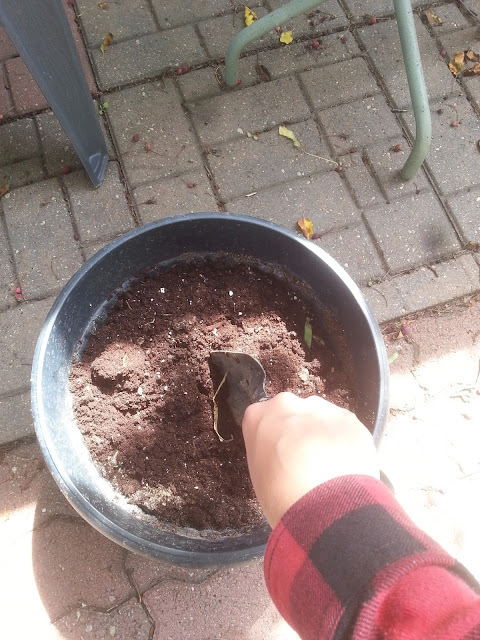 With your hand shovel, work-up the soil in your pot. If your soil looks unhealthy, use fresh potting soil instead. Press the soil into the pot firmly but gently. You don't want to compact the soil too much. Now, back to the aloe vera plants. Just look at that long string of aloe vera. It was actually a lot longer than I thought it was. To begin, look along the length of the entire plant, do you see stalky portions with no leaves? Take your scissors and cut across the stalk in these places. I made 4 cuts in total, turning one long plant into 5 shorter plants. 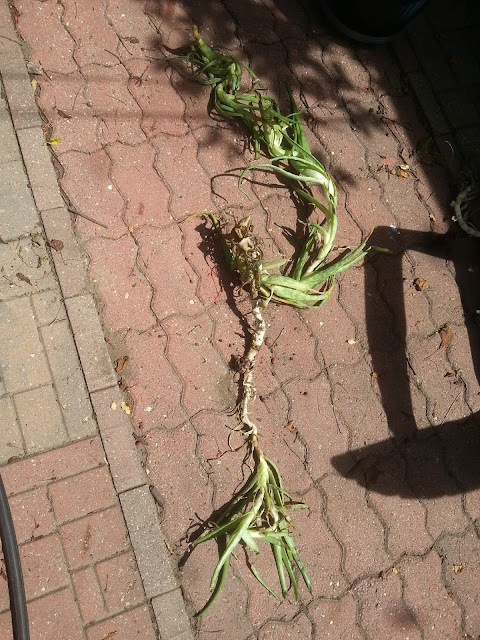 Line up your 5 plants and remove any dead, dry, rotting, or mushy foliage with your scissors and any areas of dry, dead stalk. Now, we need to create some roots. Gently pull off the bottom 2 leaves from each new plant. This will expose some roots or root nubs (small brown protrusions which kind of look like small claws), which will later become roots. Dip the roots or nubs into your rooting hormone, if you have some. 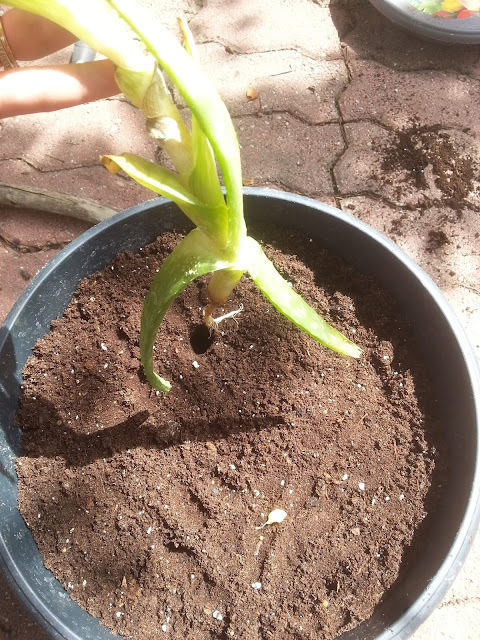 The rooting hormone will help the new plants grow new roots faster. I highly recommend it. If you can't find rooting hormone to buy locally, you can purchase it on Amazon by clicking HERE (Amazon Affiliate Link). Now, your plants are all ready to go, we just need to plant them. With your finger, poke as many holes in your soil as you have plants. Insert one plant, in each hole and firm the soil around it. Give your plant a drink of water, but do not overwater. Aloes don't like too much water. Now, stand back and admire your new aloe vera plants! But wait, don't leave yet, there's more! Look at this huge pile of aloe trimmings. 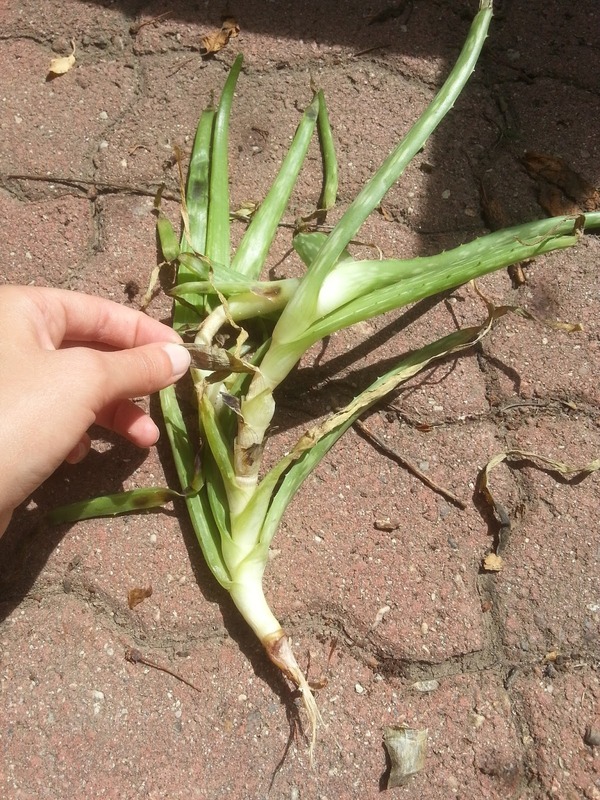 Go through your pile and collect any healthy, juicy looking aloe leaves. Bring them inside. Wash and dry them carefully. 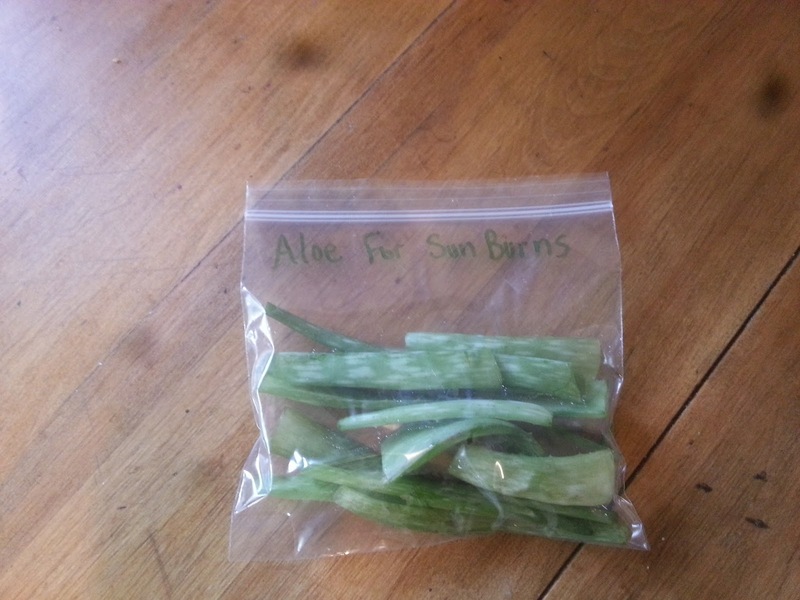 Package them up in a sandwich bag and store them in the freezer to use on future sunburns! 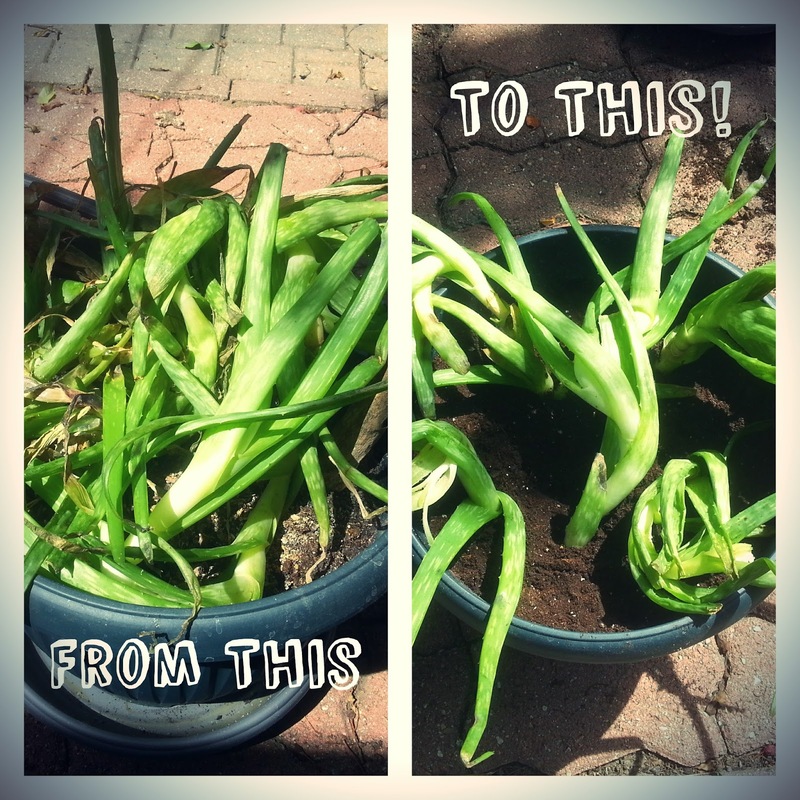 The rest of aloe scraps that are not useful can be placed into your compost bin! Well, there you have it, folks. We're all done. 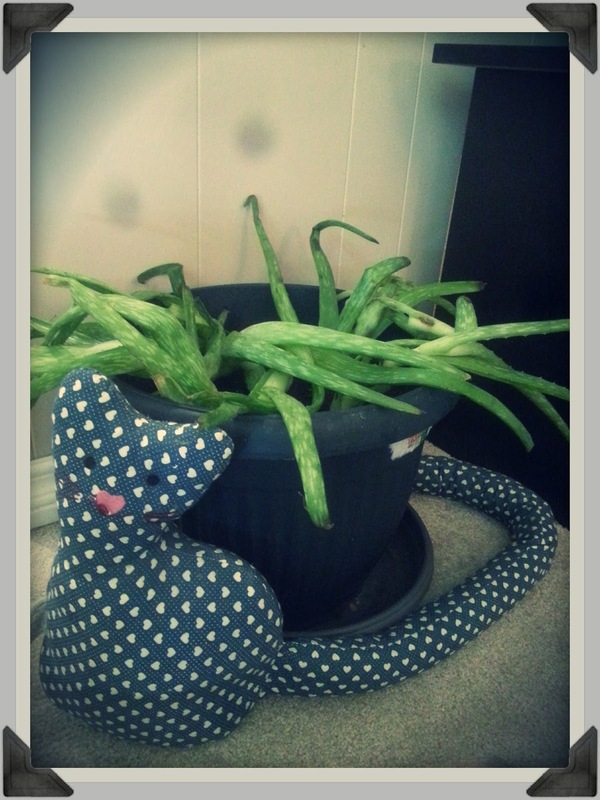 Here's one more picture of the aloe plant, returned back to its home beside my kitty cat draft chaser. 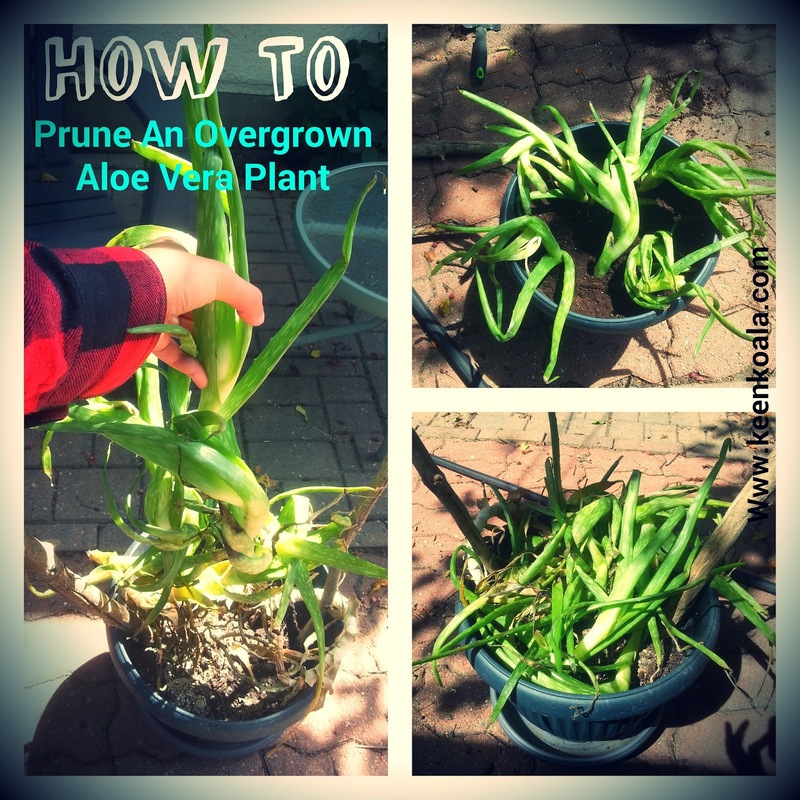 I hope this tutorial gives you the inspiration to prune your own aloe vera plant! Do you enjoy my tutorials? If so, you can Like me on Facebook by clicking here.